In May 2017, I proudly moved the tassel on my graduation cap from right to left as I earned my Marketing degree from East Carolina University. However, this anticipated achievement wasn’t the only reason for my eager enthusiasm leading up to graduation day. My goal throughout college was to have some kind of marketing position locked down prior to walking across the stage to accept my diploma—well, the rolled up piece of paper that represented it at least. A couple weeks prior, I accomplished that goal by accepting an internship with Walk West. Although some questioned my reasoning behind acquiring a position as a marketing intern over a full-time job elsewhere, I knew this was the best move to jumpstart my marketing career. During my initial job search, I didn’t apply for any marketing internships. To be honest, the thought didn’t even cross my mind until one of my connections introduced the idea and informed me that I didn’t have to be a student to apply for one. 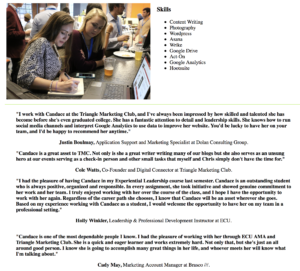 Although I gained great experience from college internships and student organizations, I was aware that I still had a lot to learn as I began my journey as a new marketer. I knew I needed agency experience to explore my career further before being siloed into a marketing specialty. While degrees and certifications are important, the real value comes from hands-on work experience. But ultimately, I knew it was my responsibility to forge my own path and flourish in the position that I was in. Realizing that my first position would be essential in setting the pace for my career, I did a lot of networking and research on various companies and agencies in the Triangle with career opportunities in marketing. At this point, I was looking for a solution to my current situation and, most importantly, I was searching for a position that enabled professional growth, challenged me daily, played a significant role in skill development, provided hands-on experience, and surrounded me with talented mentors. Walk West exceeded all of those expectations. From Lunch & Learns to one-on-one training sessions and check-ins, the mentorship and insightful advice that I received from the team provided a collaborative and positive learning atmosphere. 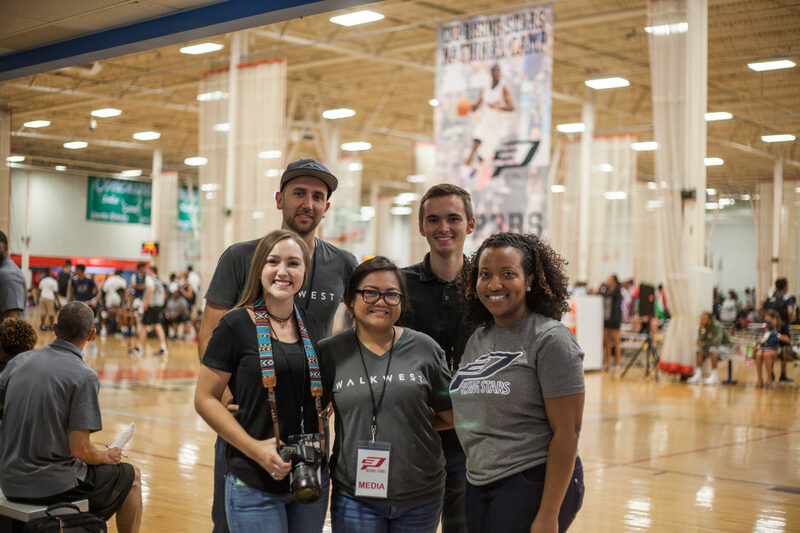 The internship had no limits, which was very appealing to an entry-level marketer like myself with a hunger for absorbing as much marketing knowledge as possible while participating in unique experiences—just to name a couple, photographing Chris Paul’s CP3 basketball camp and presenting marketing ideas at a Salvation Army board meeting. Amidst my job hunting journey, I maintained a long-term mindset. I didn’t want to settle for something simply because it was “full-time.” Instead, I searched for businesses and positions that met the criteria I had established. I determined that any company can hire for talent, but the kind that sees true potential and invests accordingly was the type I wanted to begin my career with. With a clear goal in mind, I made the ultimate decision to “Walk West.” Since day one, I’ve been able to add a myriad of skills to my personal marketing toolbox and have contributed to many projects. Honestly, if you name it, I probably learned it. 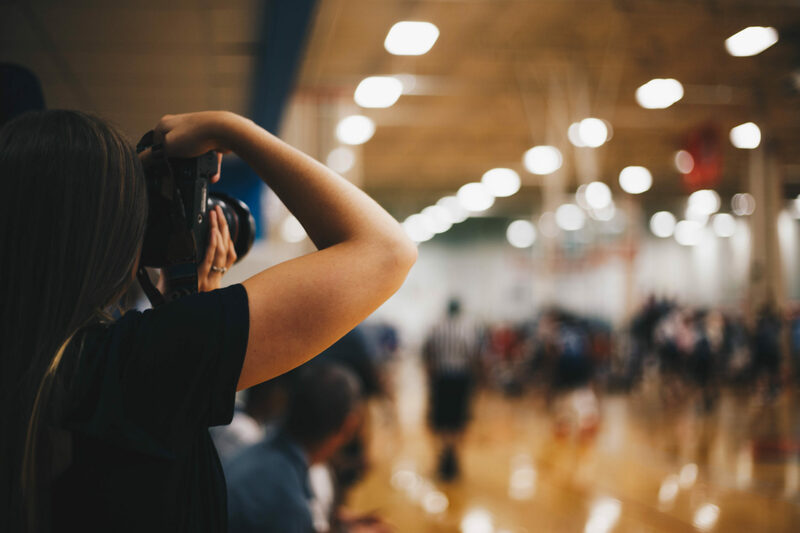 Even if I was familiar with how to do a certain task, I remained curious on how to incorporate best practices and was always looking for opportunities to learn and stay involved. Internships can be very valuable but it all depends on what you make of it. With all that said, don’t limit yourself to only applying for entry-level marketing jobs. Instead, apply for internship opportunities regardless of whether you are a current student or recent graduate. Look past the fancy title and pick a position at a company that challenges you to leave your professional comfort zone, offers continuous learning opportunities, and supports your ideas. Looking back on the entirety of my internship, I can say with confidence that I was right to invest in Walk West. 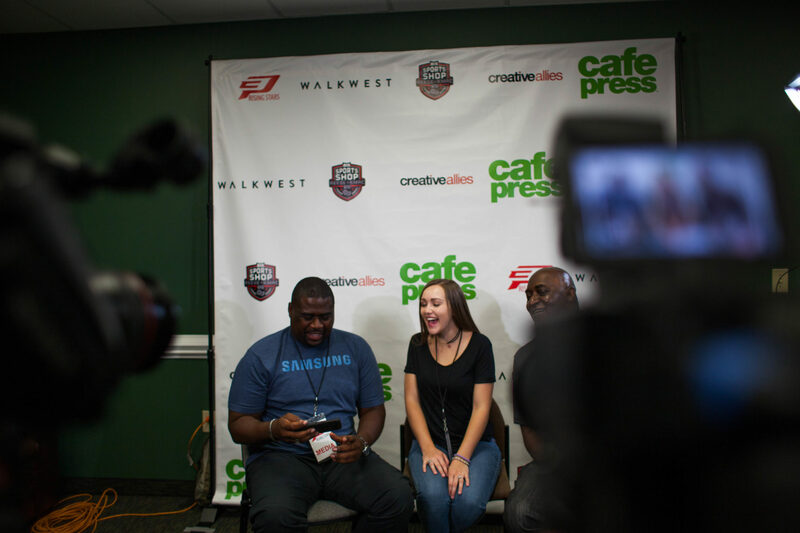 As a result, I’ve learned a multitude of valuable skills from some of the most talented marketing minds in the Triangle, gained hands-on experience in all forms of marketing, and am now an official part of the Walk West team as a Marketing Specialist. 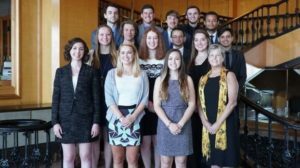 Are you interested in jumpstarting your career through a Walk West internship? Visit the Walk West careers page for a complete listing of positions. This blog post was originally published on WalkWest.com. After reading part 1, you now know the first steps that I took in order to begin my personal brand campaign. To give you a quick recap, I first set a goal, then created a set of forms, set up progressive profiling rules, and retrieved the gated content URL to place within an iframe generator. 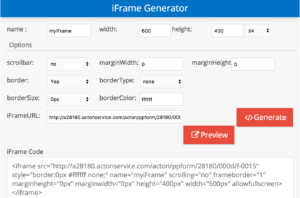 Within this post, we will flow right back into the next steps I took after utilizing an iframe generator. In part 1, I discussed how I had to create three of everything. Similarly, it is essential to have three landing pages as well. I designed each of my landing pages to relate to my different pieces of content. After I was finished designing, I copied the iframe code that I generated and pasted it within a “Custom Content” block. By pasting the code in the landing page, Act-On automatically linked my progressive forms and media to the landing page. Displayed below are screen shots of my three landing pages with their appropriate progressive profiling forms. 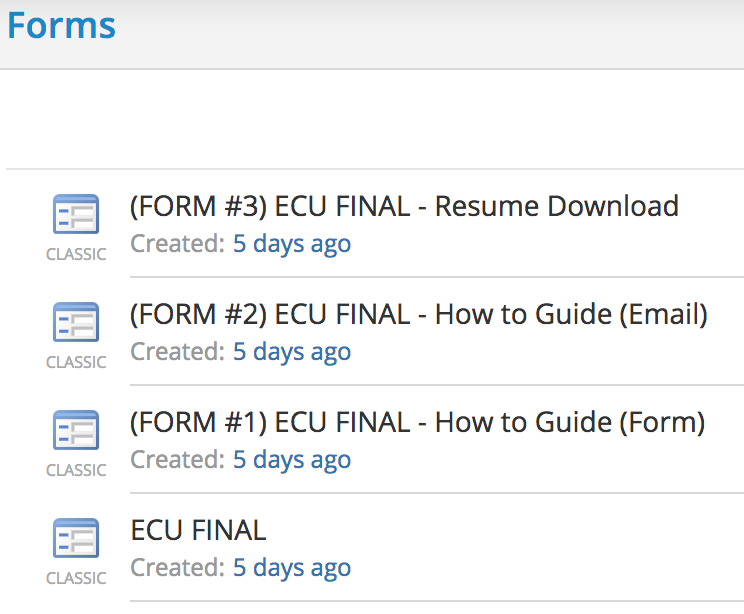 Once each form is completed and submitted, the user will automatically be given the downloadable content for each specific form. 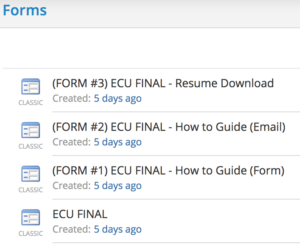 For example, my first form was designed to give out a step-by-step guide that I created titled, “How to Create a Form in Act-On.” The second form displayed my second piece of content called, “How to Create an Email in Act-On.” In my last form, the submission resulted in the person receiving my resume. 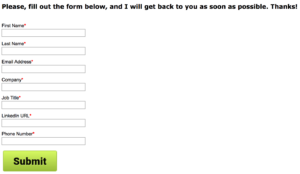 Outside of the downloadable content, a personalized thank you email set to send for filling out each form. Each of the emails was catered toward the certain piece of content the reader received. Also, the email included another attachment to each of my content pieces and directed the individual to check out my website, blogs, and photography. 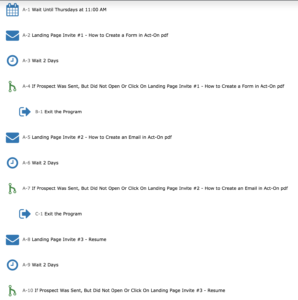 Under the tab, “Program Messages,” I added my three landing page email invites. For each of these emails, I included a public URL hyperlink to each landing page that it goes with. I also gave each email a very descriptive title to tell me which email contained the specific landing pages and appropriate content. Lastly, I had to set up a solid program flow. I created this to take each contact on a specific journey based off of their behaviors. For this flow, I included the three program messages that are displayed above. The purpose of this automated program was to invite the contact list to each of my three landing pages. For each landing page that they visited, they saw one of the three progressive forms that I created. After they submitted the form, they received one of my three pieces of content based off of the certain form that they completed. Also, they were sent a thank you message with the attached content piece. The contacts continuously moved through the automated program until they reached the final step or exited sooner based off of their behavior. As all marketers know, it would be foolish not to test a project out before sending it out. So, to ensure that my email marketing campaign would run smoothly, I tested it out on myself multiple times. 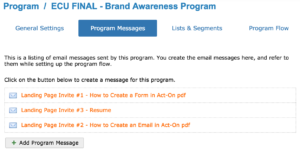 Once I was happy with my work, I hit the “Start” button to begin my first email marketing campaign. 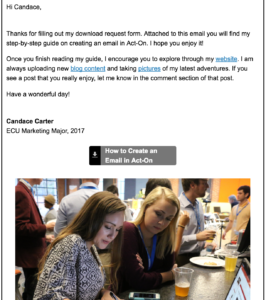 It was exciting being able to learn how to create an email marketing campaign through the Act-On Marketing Automation system. I believe this skill will be very useful throughout my career path as a marketer. In fact, this campaign may even be able to help me land my dream job! 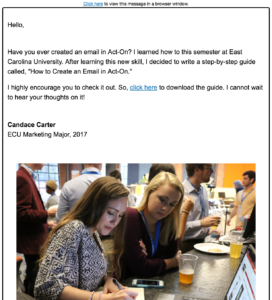 During my Marketing Automation class this semester at East Carolina University, my classmates and I were tasked with creating a campaign using Act-On. The purpose of this campaign is to display our individual talents and personal brand to a list of 80 professional marketers. Through this post, I will show you exactly how I created mine. Before beginning any successful project, it is essential to set a goal and map out the steps you will need to take in order to reach that objective. In this case, since most of us are graduating, our goal for this project is to land a job and build connections. With that being said, we have to prove our worth and display our skills throughout the campaign before we can achieve our end goal. The image located below displays my master form. Within this form, I included all of the information that I plan to receive from my email list. Although this particular one will not be used, I created this one first in order to duplicate my CSS for the ones to follow. The first of my three forms asks the recipient to enter their first name, last name, email address, and company. Once the individual enters in all of this information, they will be given the first downloadable piece of content and sent a thank you email. For my second form, I attached my second piece of downloadable content. To receive new information from the reader, I asked for their job title and their LinkedIn URL. With their LinkedIn URL, I can now connect with them. Now that I have all of the basic information that I need from each individual, my third form simply asks for their phone number. This form includes my most valuable piece of content, my resume. If the individual would like to view my resume, I request their phone number in return. After I receive their number, I can contact them and make arrangements to network with one another. With so many steps required to properly run my personal branding campaign, I specifically named each form so that I can easily keep track and differentiate between them quickly. As you can see by the picture below, the master form is titled, “ECU FINAL” and the other forms are labeled in order from one to three. Also, I clarified in the titles which specific content is attached. Now that all of my forms are created, I can create progressive profiling rules. Since I created three forms for my three pieces of content, I needed to have three progressive forms. I labeled each of my progressive forms so that they match the order of my downloadable content. By doing this, I could easily keep track of which is first, second, and third. In terms of the rules, I created the same three rules for each of my progressive forms. Although this may seem repetitive, it is essential to remain organized and specific. For each rule, I selected a specific form that I would like to be displayed. Instead of simply using only the basic forms, we used progressive profiling so that we did not repeatedly ask our contact list for the same information. Instead, the rules catered the form sequence in the correct manner that the contact needed. Having completed my progressive profiling, I was then able to generate a gated content URL for each piece of downloadable content. 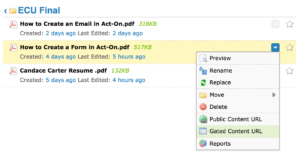 Within my media library on Act-On, I selected on the drop down arrow next to each file. I then clicked on “Gated Content URL” and hit the “Add” button once the pop-up box appeared. In the drop down box, I selected the set of progressive profiling rules that matched the specific content that I was retrieving the gated content URL for. For example, for my first downloadable piece, I selected the progressive form titled, “ECU Final – Content #1.” After this was selected, a link was displayed available for use. I did all of these steps for each of my three pieces of content. Next, I copied the gated content URL and inserted it into an iframe generator. 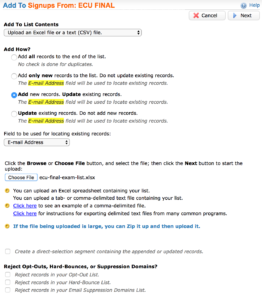 This is a crucial step because it must be completed for each file in order to include the progressive profiling form and downloadable content within my landing pages. Stay tuned for part 2 of how I created my personal brand campaign! 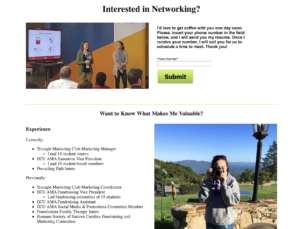 I started attending networking events during my junior year at East Carolina University. A few people in my organization, ECU AMA, were about to attend a Triangle Marketing Club networking event, and so I decided to go as well. After this event, I jumped at the chance to attend any other networking opportunities that our members were attending. Ever since January 2016, I have attended a minimum of one networking event per month. So, why is it that I enjoy these events so much? 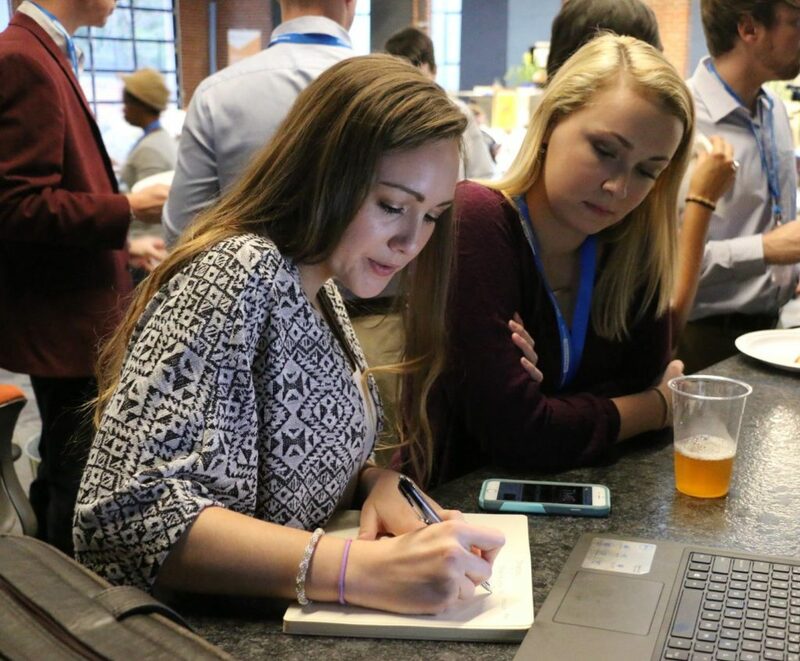 Being a broke college student, I jump when I hear the word, “free.” At most networking events, there are usually opportunities to be entered into a drawing and to obtain free swag. I mean, who doesn’t love free stuff? So far, I have won a growler from a Red Hat networking event, a few pairs of concert tickets from Triangle Marketing Club events, and a ticket to the next Internet Summit! Some may say that I am very lucky when it comes to winning things, but I like to think it’s my dedication for attending so many networking events over the past year and a half. Who knows what I might bring home from this month’s networking event! Similar to the free swag and giveaway items, food is always an exciting incentive. Especially when it is free! Most of the networking events that you attend will have beverages and appetizers to snack on while you are networking your way around the room. Food is a great way to calm your nerves while you build up the courage to go up to someone new and introduce yourself. Or, in the worst-case scenario, going to get food could be a great way to exit an unwanted conversation with someone. Regardless of your reasons, free food is just another great incentive to attending an event. Being that I am very extroverted, I really enjoy meeting new people and learning about their career experiences. In addition to my general enjoyment of having great conversations, networking is crucial for finding a job. Through my classes and meetings with my AMA chapter, I have learned the importance of expanding my connection base. With the competitive job market, it is essential to have connections in order to venture out to new career opportunities and find a job. At networking events, the most valuable thing that you will leave with is connections. Although all of the other things are awesome bonuses, the main focus and reasoning behind these events are to build a strong network. With that being said, try to find a great local event in your area that focuses on the relationship and networking aspect at the event. Put in the comment section your favorite place to network! I’d love to read about them! 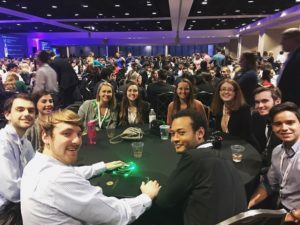 Every year our East Carolina University AMA chapter attends the American Marketing Association International Collegiate Conference. 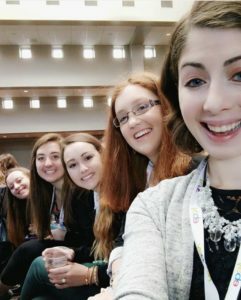 During my first year involved with this organization, I was invited to join a group of students to travel to the conference. Unfortunately, I was unable to go. This year, however, I was able to attend. Being my senior year, I was so ecstatic that I was given this opportunity and was fortunate enough to travel with my organization. 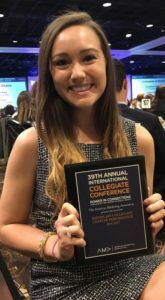 The 2017 AMA ICC was the 39th collegiate conference in AMA history. In preparation for the conference, our group downloaded the AMA Event App. Through it, we were able to see the agenda, connect with other students, and read about the speakers. The conference had a full agenda set for each day. This schedule included a variety of sessions for students to learn and obtain knowledge from many successful business professionals. Outside of the sessions, there were also competitions and other events at the conference such as Mix ‘N Mingle where students could meet people from other AMA chapters. There were many different kinds of sessions. Some were designed specifically for faculty advisors and others for students. In terms of the student sessions, these topics related to creating a successful career, organizational development, and general marketing topics. Each individual was able to pick exactly what interested them and attend any sessions of their choosing. 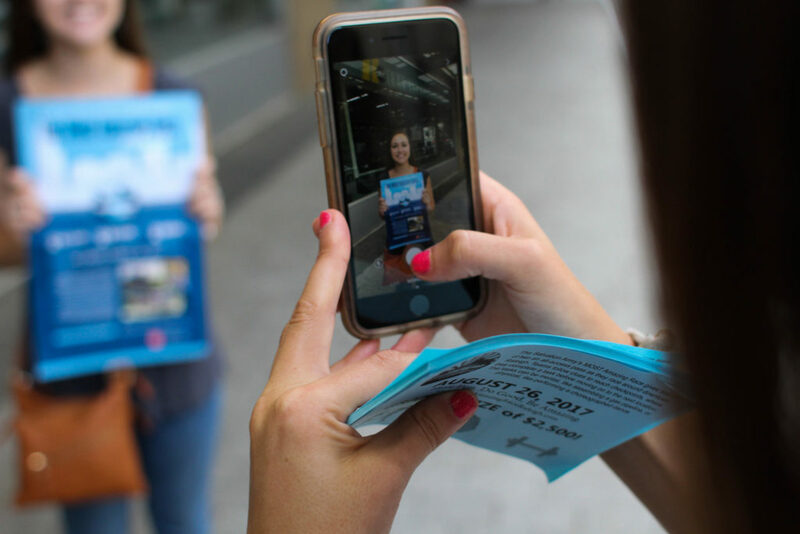 Promotional Marketing | The Industry. The Community. The Careers. A Social Media Double Shot! As you can tell by the titles, there were many beneficial presentations. Our members split up, attended a variety of sessions, and obtained a lot of great knowledge to share with the rest of our chapter. There was also a career fair featuring many of the conference sponsors. Our ECU team learned a lot at the conference. Some information that was shared during sessions was already known by some of our members due to our chapter meetings and some of our ECU classes. However, there were still quite a few things that we were able to bring back to campus to share that we have never learned before. This acronym can be used as a guide to properly set up an email. For example, the message is what you are trying to get across to the person who receives your email. The action section is referring to the steps you are asking the receiver to take. The details are specifics relating to how they can complete the action. Lastly, the explanation tells the reader why they should complete the action in order to fulfill the sender’s message. I really enjoyed learning about this email tip, and now I often think of this acronym when composing my own emails. This was just one of the many things that our group was able to bring back from the conference. 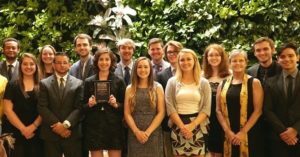 In fact, besides this new knowledge, our chapter brought back something else that we are very proud of… an award! Our chapter was awarded, “Outstanding Chapter Planning and Communication” for the 2016-2017 school year. We were so excited about this accomplishment that our group cheered very loudly when our chapter was called out. It is such an honor to achieve this award, and we were thrilled to be recognized for all the hard work that our members have completed this school year. 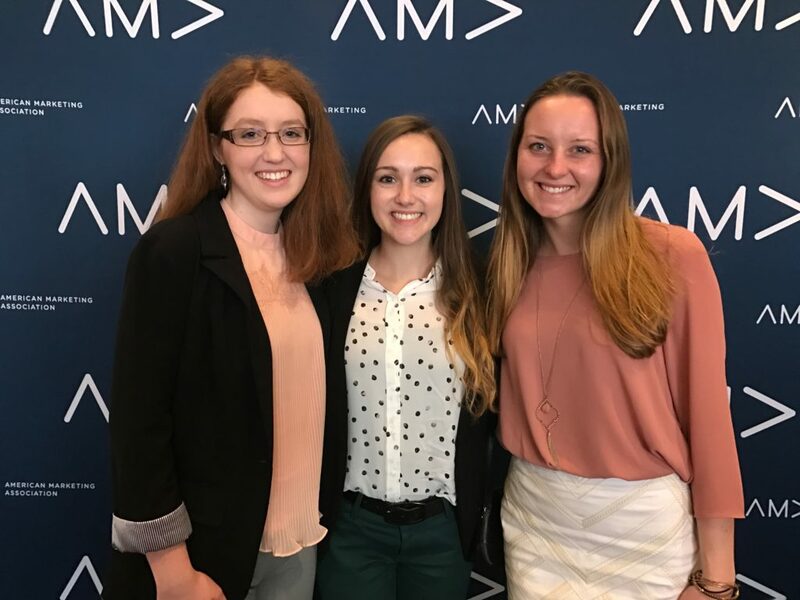 I had a blast at the American Marketing Association International Collegiate Conference and am so glad I was blessed with the opportunity to attend. Thank you, ECU AMA, for providing me with a great experience for my first marketing conference and most importantly, a great year within the organization. It has been awesome serving as the ECU AMA Executive Vice President for the 2016-2017 school year. 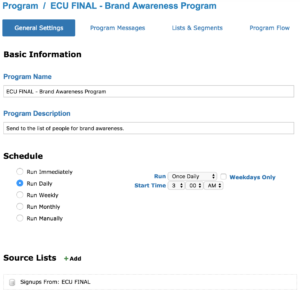 This blog post was written for East Carolina University. 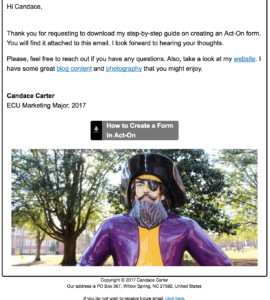 This blog was written by ECU ‘17 marketing major, Candace Carter. It’s my senior year, and these past four years at East Carolina University have flown by in the blink of an eye. As I began my last year as an undergrad, I created a list of companies that I wanted to apply for prior to graduation. However, that was just the beginning of my preparation work for the job hunting process that I was about to embark on. I started researching job descriptions for the career path that I was about to begin and noticed a lot of similar qualities and work experience that hiring managers look for in their applicants. 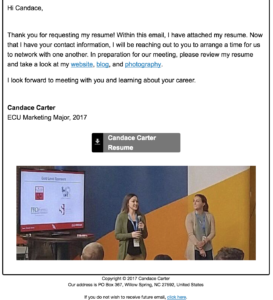 Being a marketing major, I knew that there are many valuable skills that are highly recommended to obtain in order to land the dream job which I have been searching for. Specifically, there are multiple certifications that could help me stand out amongst my peers who are also applying for the same type of entry level positions that I am. Upon hearing of the new Marketing Technology and Automation course offered at ECU, I knew that this was a class that would provide me with real marketing experience that I desired. Although this is just the beginning of the semester, I can already tell that the style of this course is completely different from any other marketing class that I have taken. The purpose of the course is to provide students, like me, with the skills to utilize digital marketing tactics and the opportunity to not only obtain two highly desired certifications in Google Analytics and Act-On Marketing Automation but to also learn how to use the tools in real marketing situations. The design of this course uses a hands-on approach. 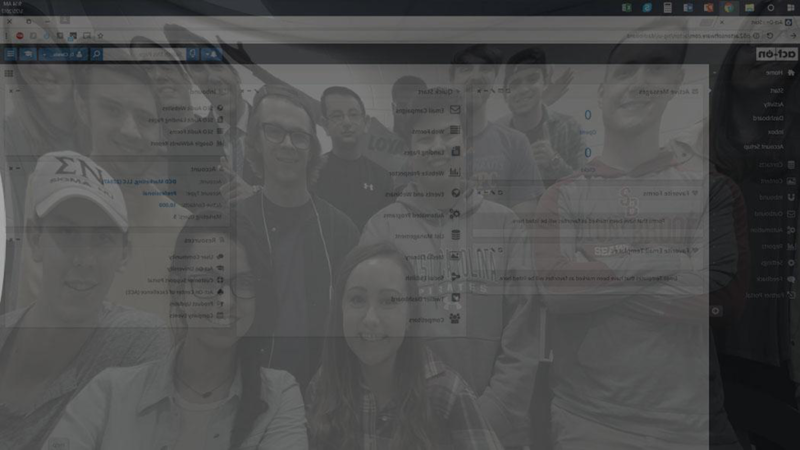 For instance, during the first week of class we were instructed on how to purchase a domain unique to our names, set up hosting, implement WordPress, and link Google Analytics and Act-On to our new websites. Outside of class, we were given the task to create an appealing display and customize our websites that will present our own personal brand. As a marketer, it is essential to understand how branding works and to establish a specific “brand” for yourself. 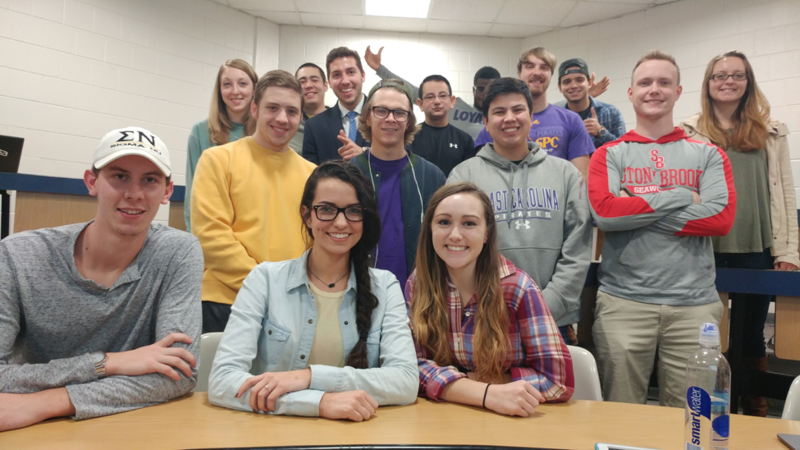 Within this class, we have been assigned with the task to construct a personal website that informs the public of who we are as our own personal brand and exhibits the talents that we have as well as skills that we have acquired over our time spent at ECU. Each of us purchased a domain name as well as hosting through either GoDaddy or TigerTech. We then hooked up WordPress to our new domain where we have been able to establish our brand and use the site as a portfolio. 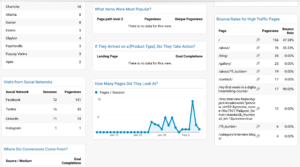 After everything was set up, we linked Google Analytics and Act-On to our websites. The semester is broken up into two sections. The first consists of learning the ins and outs of using Google Analytics. During this section, we are going to learn the fundamentals of the tool and how to use the different features through our newly created website. Also, we will become certified in Google Analytics which will be a great addition to all of our resumes and LinkedIn profiles. The second section of the semester revolves around Act-On Marketing Automation. In this part of the course, we will learn how to navigate through the software and will gain experience in concepts such as creating email marketing campaigns, building landing pages, and posting on social media through Act-On. I look forward to learning more about digital marketing and having the opportunity to apply all of the knowledge, skills, and certifications that I gain from this class within my future career. As a student, we strive to stand out among our peers. Especially when we have begun the stressful, but exciting job hunt. Many of us have even been told that continuing education will not stop once we have secured a job after graduation. So, why not go ahead and acquire some of that extra knowledge and skills that could potentially help land you in the resume pile that might actually reach the hands of the hiring manager at your dream company. In fact, it also might give you a head start and an easier transition from being a full-time student to beginning your new professional career in the marketing. Outside of my own research on certifications, I’ve networked with multiple marketing professionals over the past year and asked for their advice. Many of them have recommended certain certifications that they believe would be a great addition to any future marketer’s skill set that would set them apart from the average student. 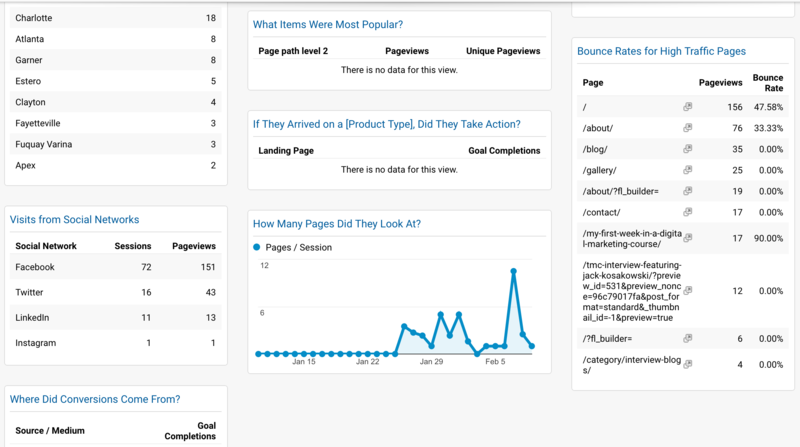 Google Analytics is a great tool that all digital marketers should understand how to use. 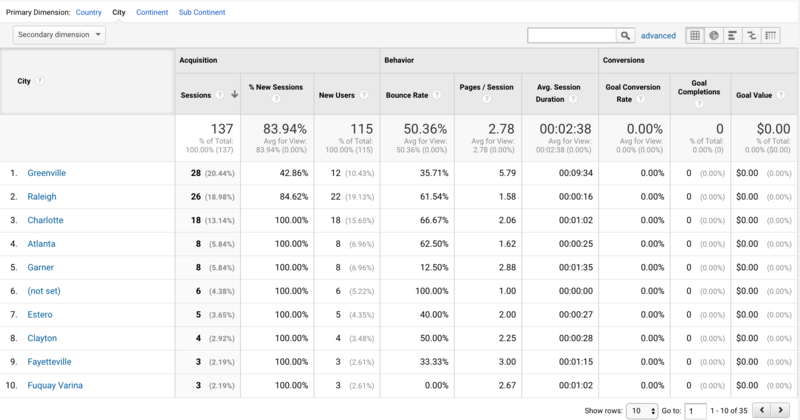 Using Google Analytics will help you better understand your customers and learn their behaviors. It tracks the traffic for your website using metrics and gives you a better understanding of how effective your website is. Obtaining this certification is free of charge. In fact, if you create a Google Analytics account and link it to your personal website, you can practice implementing the skills that you learn while studying for the certification exam. You know that little green box that says “Ad” when you Google something? Well, that is a great example of Google Adwords. Businesses pay Google to display their ads on the search engine. Here is the catch, they only pay Google when someone actually clicks on their ad. This is such a great tool for businesses to use to reach out to potential online customers. It’s pretty effective because the people who are searching for those specific keywords that relate to your business really want your service and will most likely click your ad because it’s what they are already searching for. So why not get certified in this as well? It’s also free to take the certification and to practice for this exam. 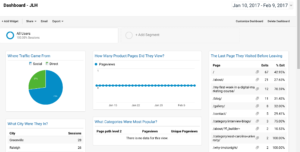 Act-On is a marketing automation tool used by marketers who want to provide a great experience to their customers while measuring the results that can help provide insights on who their customers are and understand their descriptive attributes. You can also create automated campaigns through this software that your whole team will love. I became certified in this software over the summer through my work with DCD Marketing. I received my certification through Brainshark and really learned a lot about Act-On. Another certification that I recommend is with Hubspot. According to their website, “Hubspot is inbound marketing and sales software that helps companies attract visitors, convert leads, and close customers.” This tool is all about engaging with the customer. This certification is free of charge, and you can begin preparing for the course here. Similar to the other tools, all you have to do is create an account, study, and then take the exam. As businesses are becoming more familiar with the use of popular social media platforms, it is vital for them to not only provide relevant content on these channels but also remain active. Hootsuite allows users to easily manage their social media accounts and schedule posts in advance. The company provides five free online courses on their website for individuals to use at their discretion. However, in order to become certified, you must pay a one-time fee to take the certification exam. Each fee varies depending on which test you are taking. Hootsuite also provides other resources to help further the social media knowledge among their users. For instance, their blog consists of learning topics such as Facebook Marketing, Twitter Marketing, Instagram Marketing, and Video Marketing. Another great source of learning assistance comes from the Hootsuite Help Center. This resource is designed to display common questions and answers as well as accept specific questions that you may have. Get certified as soon as possible! Of course, there are many more great tools that marketers can get certified in, but these are the top 5 that in my opinion are worthwhile to obtain prior to graduation. If you are currently enrolled in a college degree program, I highly recommend researching the courses that your university offers. For example, this semester at East Carolina University I am taking a class called Marketing Technology and Automation, and I will leave this course with certifications in Google Analytics and Act-On. So, research your classes and take advantage of the opportunities that your university offers. If you can’t find one that offers certifications, then be proactive and dedicate a weekend to getting certified in something that would enhance your resume. 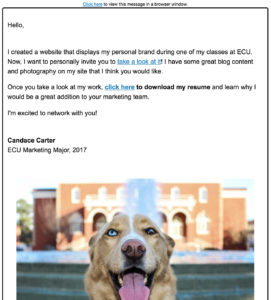 As you now know from one of my previous blogs, I am enrolled in a Digital Marketing course this semester at East Carolina University. During our Google Analytics portion of the class, we had a very talented guest speaker, Jenny Halasz, travel to Greenville so she could teach us more about utilizing this tool. Her presentation included the topic of accounts, properties, tagging, KPIs, reports, filters, managing dashboards, and understanding what all of the data that we receive in Google Analytics represents. Once the new view was created, I pasted the link that Jenny gave our class into my browser. After it loaded, the page displayed a box that allowed me to select the new view I just created to apply the dashboard’s settings. I then titled the dashboard, “Dashboard – JLH,” and hit the create button. Once the creation process was complete, I shared my website to all of my social media platforms, and the traffic to my site began to flow in. After I gave it some time, I logged back into my account the next morning to review all the data that was collected. From the home tab, I selected the new view that I created the afternoon before and began exploring the dashboard. 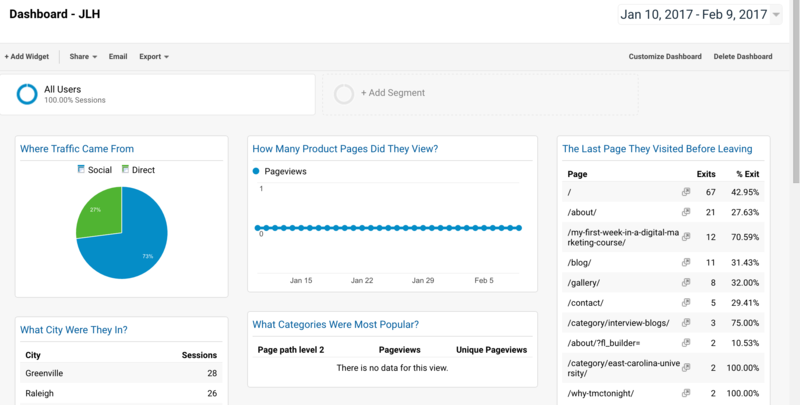 As a new user of Google Analytics, this dashboard made everything so much easier to understand. The configuration of the dashboard was really straightforward and provided relevant information. For instance, I could see in the form of a pie chart whether my traffic was coming from social or direct, which city the viewer was in at the time they visited, the social network that brought them to my site, the number of pages they looked at, the bounce rate, the pageviews for high traffic pages, exits, and more. As you can see, this dashboard is very user-friendly and is a great tool to have. For example, I could easily tell from the results that the majority of my traffic came from social media, specifically Facebook with 72 sessions and 151 pageviews. Also, the viewers of my site were located in mostly Greenville, Raleigh, and Charlotte, North Carolina. Outside of the quick view in the dashboard, I could even dig deeper into each widget by clicking on the blue link at the top. As Jenny told us, “This is your ultimate weapon.” I’m grateful that Jenny shared these awesome dashboard settings with us and shared her knowledge on the ins and outs of Google Analytics. I can honestly say that her presentation and applying what we learned has really helped me with navigating through my Google Analytics account. 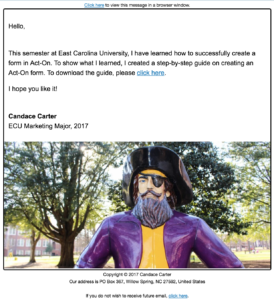 This semester I decided to take a new marketing class at East Carolina University, Marketing Technology and Automation. This class is designed to provide students with real marketing experience while using an interactive learning approach. Throughout this semester we will learn how to use two great marketing tools. The first portion of the semester will be dedicated to Google Analytics and the second will be revolved around Act-On Marketing Automation. During the first week of class, we were instructed on how to purchase a domain and hosting. We were given the option to purchase these through either GoDaddy or TigerTech. I personally chose GoDaddy due to the fact of the brand recognition that I have associated with the website. The purchase of both domain and hosting amounted to around $68.00, which is far cheaper than a textbook. Once we purchased those, we then went to the next step of managing our Linux hosting through our cPanel navigation. Within the cPanel, there are multiple options. However, we went straight to the WordPress building wizard. The steps were very easy to follow and once we completed them we were able to customize our new website in a unique design that demonstrates our own personal brand. Outside of implementing Google Analytics, we also have begun the first part of the preparation for the Google Analytics certification. During this first week, our homework assignment was to complete units 1-3 in the Digital Analytics Fundamentals section. This section includes videos and practice questions on the basics of using digital analytics, creating a measurement plan, and of course, how to begin using the wonderful tool, Google Analytics. As you can see, I have learned a lot this first week of class. Outside of the website building and marketing tools I have been implementing, I have also gained some new basic knowledge about digital marketing. Just to touch on a few key points, we can track everything that people do using digital marketing. 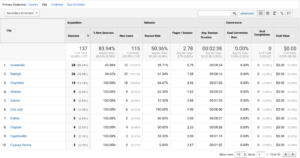 For instance, Google Analytics tracks real-time results using numerical data and Marketing Automation monitors descriptive specifics such as who. Secondly, the reason behind why we track people is because our prospects can sway back and forth. Often times, what people say they do and what they actually do turns out to be two completely different things. Thus, monitoring behavior on a website can be very important and revealing to what their actual behavior will be. Lastly, the only constant in digital marketing is change. We are living in a thriving digital world that constantly introduces new innovations. Therefore, being a marketer means that learning will never stop. Throughout the entire career of a marketer, it is essential to stay relevant and to learn new skills. I look forward to learning more throughout this semester about the world of digital marketing.